CNN Poll: Half the country disagrees with Obama on issues. WASHINGTON (CNN) - For the first time since he took over in the White House, Americans don't see eye to eye with President Barack Obama on the important issues, according to a new national poll. But the CNN/Opinion Research Corporation survey does indicate that a majority approve of how Obama's handling his duties as president. According to the poll, which was released Tuesday, 48 percent of people questioned say that they agree with Obama on the issues that matter most to them, with 51 percent saying no. That's a switch from April, when 57 percent said they agreed with the president on important issues, with 41 percent disagreeing. "Obama is facing crunch time on a number of controversial issues, from health care to financial regulation to cap and trade to Afghanistan," says CNN Polling Director Keating Holland. "The fact that most Americans no longer agree with him on important issues makes his task harder." Fifty-five percent of those questioned say they approve of how Obama's handling his duties, with 43 percent disapproving. The 55 percent approval rating is down 3 points from September. Most recent national polls place the president's approval rating in the low to mid 50's. "Obama continues to do poorly among senior citizens," says Holland. "Most Americans over the age of 65 disapprove of how he is handling his job as president." The poll also suggests that two out of three Americans say Obama has the qualities a president should have, down 12 points from April - one indication the Nobel Peace Prize may not have helped him much in that regard. Most Americans, 56 percent, don't approve of the Norwegian Nobel Committee's decision to award the Nobel Peace Prize to Barack Obama, and only a third believe that Obama has done enough to deserve the prize. But seven in 10 are proud that a U.S. president won the prestigious award. Sixty-five percent say they have a favorable opinion of Secretary of State Hillary Clinton, and 64 percent say they view first lady Michelle Obama favorably. Both women rate higher than the six in 10 questioned who view Obama in a favorable light. Forty-five percent say they have a favorable opinion of Vice President Joe Biden, 5 points higher than the four in 10 who view Biden unfavorably. "It's not surprising that Clinton tops Barack Obama on the favorable ratings," says Holland. "Secretaries of State don't get blamed for economic problems or unpopular domestic policies, and they often don't get the same share of the blame as the commander-in-Chief for international slip-ups either. But typically, the first lady gets even better favorable ratings than the Secretary of State, so the fact that Clinton's numbers are slightly better than Michelle Obama's is a bit surprising." The CNN/Opinion Research Corporation poll was conducted Sunday through Thursday, with 1,038 adult Americans questioned by telephone. The survey's sampling error is plus or minus 3 percentage points. Senior citizens will continue to be the biggest voting bloc against the president. He is simply too different for their old-fashioned ideas. In 2010, the GOP stands to gain due to the dissafection that this voting bloc has toward Obama. 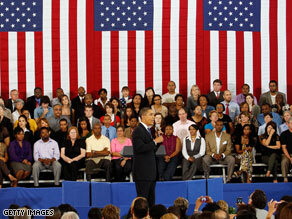 In 2012, the young and middle-aged will have a chance to reverse the power of their numbers during a mid-term election cycle. Here we go again with the polls, and their misinterpretation. CNN gives us the news that Americans have changed their minds, without examining the possibility that it's Obama who has changed. If you had asked me at the beginning of Obama's term if I supported his plans, I would have said yes. Now, I'd say no. I didn't change. Obama has failed to do what he proposed: single payer health care (or even a public option), get us out of Iraq, close Gitmo, reverse Bush's Constitution shredding. When you read polls that say American opinion has changed, remember that it is just as likely, or more so, that America has not been given what it was promised, not that it changed its mind. That means the other half agrees with him. Wow, big story. Another stellar feat of journalism by CNN!